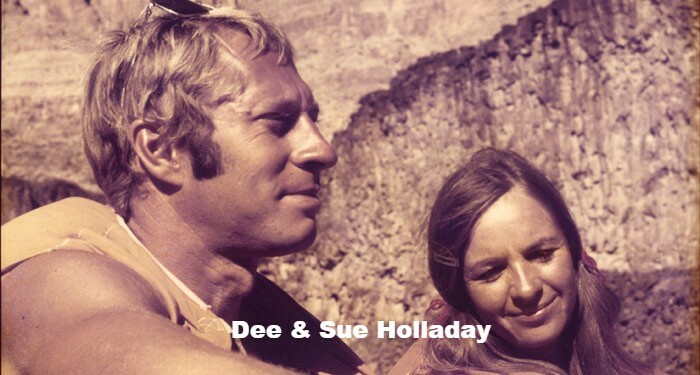 SALT LAKE CITY, UT, Feb. 3, 2016 – The late Dee Holladay was an adventurer, entrepreneur, family man and rafting visionary. The company he founded in 1966 with his wife Sue, Holiday River Expeditions, has stood the test of time and in 2016 will celebrate its 50th anniversary. Observances surrounding this milestone year will include reunion weekends and commemorative t-shirts but the main focus will be to honor Dee Holladay’s legacy as a rafting pioneer and staunch environmentalist who helped shape today’s river rafting industry. Holladay died of natural causes on Father’s Day, June 21, 2015, surrounded by family at the age 78. Today his children and grandchildren remain committed to his vision and principles and look to guide the company into the future. Member of the River Runners Hall of Fame, Holladay was a fourth-generation Utahn whose ancestor John Daniel Holladay was the founder of the city (southeast of Salt Lake City) that still bears the family name. A visionary for western river preservation and resource education, Dee was also an inspirational river guide for scores of people, young and old. 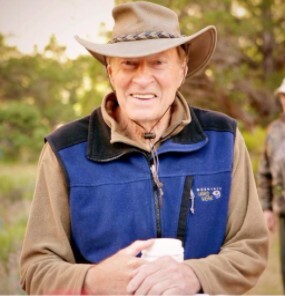 “His pulpit was an inflatable raft and his voice was quiet and smooth, yet his stories commanded the attention of tens of thousands of people from every walk of life, whether it was on one of his trips for Holiday River Expeditions, or in his relaxing backyard,” shared Utah Rivers Council. “Dee and his guides formed a magneto of positive energy that if you loved being outside and had any appreciation at all for wild and free things you just couldn’t resist being near it. By his presence and aura, Dee quite simply changed more lives than anyone I have ever known,” said son-in-law John Wood, Co-Owner and President of Holiday River Expeditions. Wood believes, as did Holladay, that “to effect change, find a release and experience renewal, you must choose to do things differently. 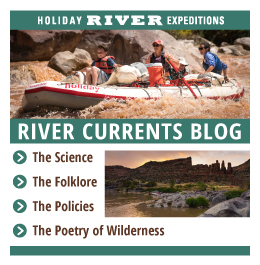 Holiday River Expeditions is different.” When other river outfitters found that adding motors to rafts would increase guest capacity and enable more trips, shorter in duration, Holiday River Expeditions has remained committed to only using muscle-powered oar boats, paddle rafts and inflatable kayaks. Holladay believed that without the speed and noise of motors, the smaller human-powered rafts bring guests close enough to the experience to become a part of it. He also made sure his rafts and gear were custom-designed, made with comfort and safety in mind. Maintaining the family connection that includes long-term staff, and the selection and training of exceptional guides who enhance the guest’s understanding but don’t get in the way of nature and the raw experience are top priorities for the future according to John Wood. To sustain this integrity, Holiday plans not to expand, but rather focus inwards, investing in the quality of their operations. 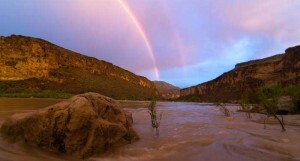 Said Lauren Wood, Holladay’s granddaughter, “Dee went beyond just conservation and preservation. He got to the heart of the interconnection of all things and rivers.” This is the legacy that Holiday River Expeditions hopes to honor and continue. Holladay’s concerns were always twofold: People should be safe while having fun on the river; and their presence in the natural world would not be a deterrent if they understood how special wilderness is. River Runners Hall of Fame director Tim Glenn said Holladay earned the honor for pioneering “many whitewater safety techniques, camping techniques (he introduced fire pans and portable toilets to his programs) and wilderness ethics adopted in management plans by the National Park Service and the Bureau of Land Management.” As an innovator, many of his raft designs are still used today. As the company enters its 50th year a number of observances are being planned. 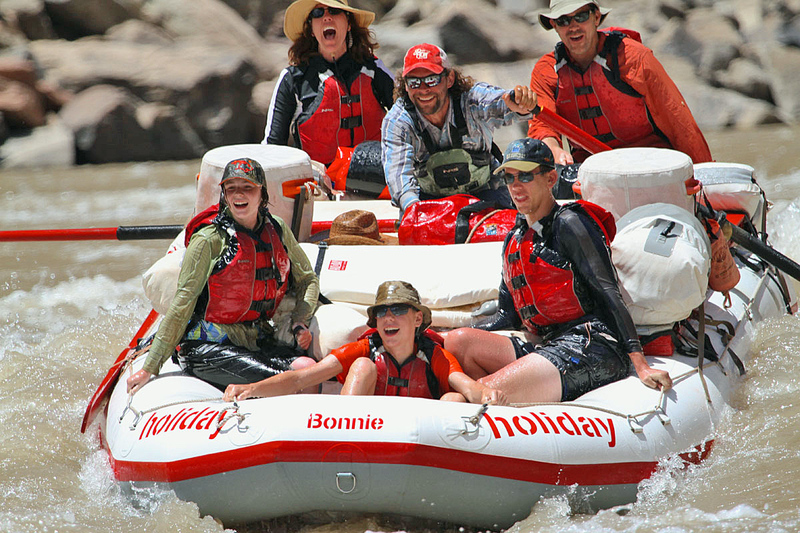 One activity is a River Guides Rendezvous that will bring past and present Holiday boatmen and guides onto the Green River for a weekend reunion that includes fun competitions and storytelling. Also, repeat guests who travel with the company in 2016 will receive a custom-designed anniversary T-shirt. Items will also be available for purchase through Holiday’s online store.